Liu Rong, a vocational school student in Ningxia Hui Autonomous Region had never heard of virtual reality (VR) until trying a headset in a special classroom at her school. Xiji county where Liu lives is so poor that most young people dream of leaving for the city to find work. Every year, 100,000 rural laborers leave the county to become migrant workers. Vocational education can play an important role in improving their skills. In October, HTC VIVE, a VR technology subsidiary of Taiwan-based tech firm HTC set up a VR classroom in Xiji Vocational School, where 3,000 students are receiving training in auto repair, tourism, pre-school education and other professions. Alvin W. Graylin, general manager of HTC VIVE (China), said the VR classroom in Xiji was the most advanced of its kind in western China. It allows 50 students to do interactive training at the same time. The company has provided the classroom with VR educational software for three majors: interior decoration, auto repairs and maintenance, and tourist service and management. Together with 40 classmates, Liu recently had her first VR class. With the help of company technicians and their teacher, the students simulated documents filing and itinerary making. “The equipment is easy to use and the lesson is interesting,” said Liu. Yang Tingting, her teacher, said most of students learned to use the system in a few minutes. “The VR system can help students become adept in professional skills in class,” said Peng Jinzhen, deputy head of the school. He said many vocational schools in impoverished western regions did not have enough funding to buy expendable teaching materials for training professional skills. The VR technology can save costs while ensuring the quality of the training. HTC VIVE is working to develop a VR-aided education assessment standard. 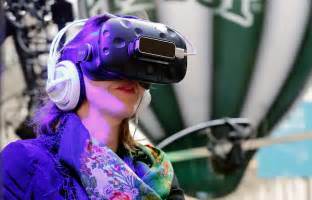 The company encourages teachers to help develop VR education content through its “One Thousand Star Teachers Program,” selecting the top entries for VR lesson designs. In the future, the company will team up with a Beijing company to produce vocational training software on elevator installation and English language teaching. Uncategorized education, school, Virtual Reality. permalink.